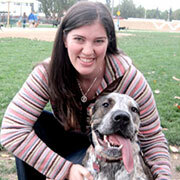 Jill MacLeese was certainly not thinking of ophthalmology when she enrolled in veterinary school. However, it did not take long for her to fall in love with the specialty, and her passion for ophthalmology has intensified ever since. Now a three-year resident at the Veterinary Medical Center of Long Island (VMCLI) in New York, Dr. MacLeese could not be happier with the path she has taken. An ophthalmologic case of uveitis, or inflammation to the uvea portion of the eye, during her second year at SGU sparked her interest in the specialty. However, it wasn’t until her clinical year at North Carolina State University that her desire to pursue an ophthalmology residency was solidified. At the 2010 American College of Veterinary Ophthalmology (ACVO) conference opportunity knocked in the form of a chance meeting with Dr. Noelle La Croix, DACVO, an ophthalmologist at VMCLI. Dr. MacLeese was granted a specialty internship in ophthalmology at the practice and in July 2012 began a coveted veterinary ophthalmology residency in a position that VMCLI made exclusively for her. The position has her working on a variety of ophthalmology cases, predominantly treating small animals, while also examining horses, birds, rabbits and other exotic species. In addition, she works one night per week in emergency medicine and travels to the University of Pennsylvania monthly for ocular histopathology rounds. Dr. MacLeese has given back to the University by working as a student liaison representative, while also talking about her SGU experience at a number of the University’s information session. She feels strongly about speaking on the University’s behalf as it has laid the foundation for her professional success.